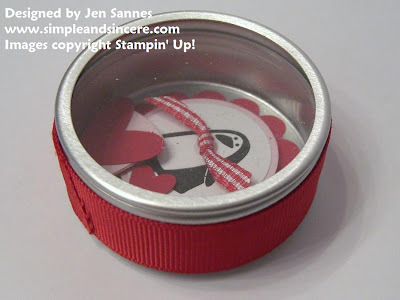 This is a shaker magnet we made at our last Mother/Daughter Stamp Night. I found these tins at Target in the bridal section and they were 40% off at the time. I stocked up because they were too cute to pass up and I knew I would find a use for them at some point! I stamped the penguin with Basic Blank ink on Whisper White scrap. I used my 1 1/4" circle punch to punch him out and layered him onto a 1 3/8" Pink Pirouette circle and a Real Red scallop. I also added a little red gingham bow tie with a Mini Glue Dot. 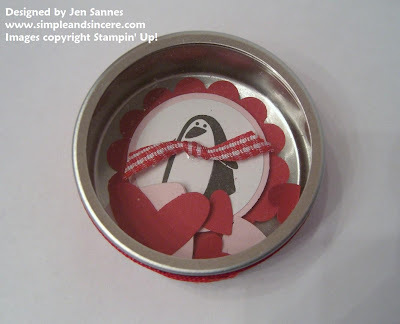 I placed the penguin in the tin, secured with a Pop-Up Glue Dot. I made the heart confetti using the new Heart to Heart punch. I finished the tin off by placing some Real Red wide grosgrain ribbon around the outside and secured the ends with Sticky Strip. I placed a self-adhesive magnet on the back so that we can hang this little guy on the fridge. A fun little Valentine's Day gift, don't you think? I'm hoping to get some time to try out some of my new toys this week. I'm looking forward to sharing my creations with you!